I wish I could post this blog entry as a field trip and not just a kindred spirit entry, maybe someday I will make it over to the other side of the pond. Inky Mouse Studios takes great pride in going the extra mile with in depth research. Sometimes this means working closely with clients and logging numerous hours hitting the books to achieve accuracy. Sometimes it means seeking out a professional for the highest caliber critique. In even rarer instances the highest level professional comes looking for you and not only provides a detailed critique but also a plethora of amazing reference material to accompany it. Such was the case of the illustration of Syringomyelia in the Cavalier King Charles Spaniel. 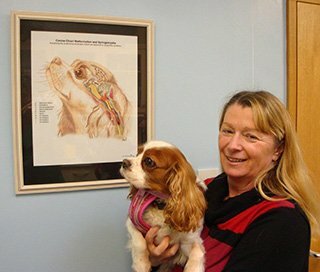 The critique was provided by Dr. Clare Rusbridge, BVMS PhD DipECVN MRCVS RCVS and European Specialist in Veterinary Neurology, of Stone Lion Veterinary Centre in London, England, one of the worlds leading investigators in syringomyelia and chiari malformation in the Cavalier King Charles Spaniel. It was both amazing and humbling to hear from someone who is at the forefront of their chosen field, and hear that they really like your illustration, but that it has some specific details that must be corrected. 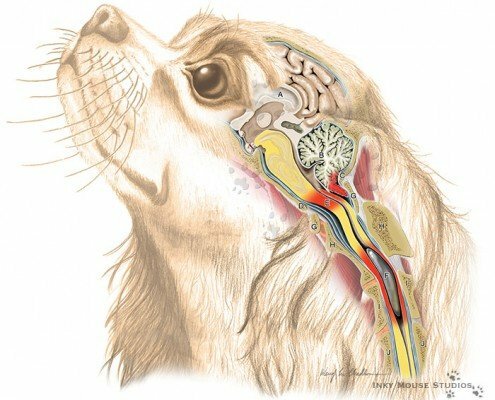 Combining her knowledge and breed specific reference materials with our illustration skills, Inky Mouse Studios was able to put her years of research into an easily understandable veterinary illustration that explains the unique anatomical anomalies and subsequent neurological conditions they cause. Actions speak louder than words, and in this case, the fact that this illustration is now hanging in one of Dr. Rusbridge’s consulting rooms speaks volumes about the fact that it is now a valuable asset to her practice. Sandra Collins from the Companion Cavalier King Charles Spaniel Club and her spaniel Rosie, during a visit to Dr. Clare Rusbridge. A print of Inky Mouse Studios’ illustration Syringomyelia in the Cavalier King Charles Spaniel is now hanging in the consulting room.